Lightning deal - get in quick. Great price, been waiting for this one a long time. Usually £207. Ordered. Thanks OP. Free delivery to dampest country in the world, Republic of Ireland. Hope these are better than the older design. I have had a few different makes of dehumidifiers over about 20 years. I originally bought ebac and then about 4 or 5 years ago bought this one (well its predecessor, which looks very, very similar apart from the electronic display) and it was absolute trash!!! The screwfix own brand looks similar and has been a cracker for the last few years. Same me too. Thought I wasn't going to get one since blackfriday finished and I was going to order the 3650e for £189 today. Same me too. Thought I wasn't going to get one since blackfriday finished …Same me too. Thought I wasn't going to get one since blackfriday finished and I was going to order the 3650e for £189 today. is it better than the EcoAir DD122 Simple Desiccant Dehumidifier, 7 L. as i have this one. Want to move that upstairs and have a new one for kitchen was looking at getting the same again. Make ecoair or amcor as keyword, as they sell dessicant dehumidifiers. Compressor dehumidifiers dont work at low temperatures . is it better than the EcoAir DD122 Simple Desiccant Dehumidifier, 7 L. as …is it better than the EcoAir DD122 Simple Desiccant Dehumidifier, 7 L. as i have this one. Want to move that upstairs and have a new one for kitchen was looking at getting the same again. Made in the UK not many things you can say that about now a days. Also has a great ethos but like John Lewis. Ordered. Thanks OP. Free delivery to dampest country in the world, …Ordered. Thanks OP. Free delivery to dampest country in the world, Republic of Ireland. Northern Ireland here so I know what you’re talking about!! Had one of these for a while - very impressed. Thanks op - I've ordered another one! True enough, however I don't live in low temperatures, I live in a centrally heated house therefore my eBac works fine, just as my Meaco desiccant one does downstairs! It might be significant for anyone wanting to dry unheated rooms, but often they are not the rooms that suffer much from condensation because -people and their activities are usually the source of the water vapour in houses that are not actually suffering from rising or penetrating damp. Had one of these since last year.. fantastic price of kit.. can highly recommend it. You'll be amazed how much water this pulls out the air. True but I'm buying mine for the humid summers that push the air con harder and from what I've read (but not personally tested) - some desiccant dehumidifiers can heat air by 10-12 degrees compared to 2 degrees for the refrigerant type which is the last thing I need. Plus, it looks as though this type is lower energy. While you offer a good point, I think it's best for hotukdealers to do a little research to see which is the best match for their use. 10-12 degrees plus could be a real bonus in winter for some. Would be perfect in my old house but not in my new one. You got that right. Here in Connemara we need multiple dehumidifiers running for months at a time. True but I'm buying mine for the humid summers that push the air con …True but I'm buying mine for the humid summers that push the air con harder and from what I've read (but not personally tested) - some desiccant dehumidifiers can heat air by 10-12 degrees compared to 2 degrees for the refrigerant type which is the last thing I need. Plus, it looks as though this type is lower energy. While you offer a good point, I think it's best for hotukdealers to do a little research to see which is the best match for their use. 10-12 degrees plus could be a real bonus in winter for some. Would be perfect in my old house but not in my new one. Our dessicant one really does warm up the upstairs of our house, not sure it's 10 or 12 degrees mind, and works a treat on condensation in the winter months which is what I bought it for. 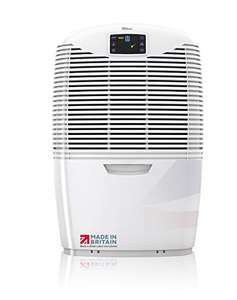 I did have a condenser dehumidifier (similar rated extraction rates) and was nowhere near as effective, and MUCH louder. This is a good price, voted hot. I have this Ebac and I am really happy with it. We had damp in an unheated room but we don’t anymore. Red light tells you when it needs emptying and we empty it every day. You got that right. Here in Connemara we need multiple dehumidifiers …You got that right. Here in Connemara we need multiple dehumidifiers running for months at a time. Conemara indeed receives more rain consequently more humidity. On a positive note, a beautiful place to visit, hiked diamond Hill this summer. Not overly impressed by mine. It’s been on for 6 days and hardly goes off. It’s taking about 1L a day out of the room. Not overly impressed by mine. It’s been on for 6 days and hardly goes off. …Not overly impressed by mine. It’s been on for 6 days and hardly goes off. It’s taking about 1L a day out of the room. I’ve ordered a desiccant dehumidifier so I can compare the two. 1 litre for the size of my house isn’t good, but maybe that’s because we like to keep the temperature fairly low.